Tucked away in a corner North of Condom, this beautifully restored stone barn is found at the end of a long driveway flanked by sunflowers, maize, wheat and striking onion fields. Originally used to make wine and Armagnac, the barn was discovered, hidden in undergrowth, by the previous owner. She sympathetically restored the ruin and created a comfy family home. Sitting in approximately 1.5 acres (approximately 6000m²), the property is located on what was formerly a royal game track, said to be where the much-loved King Henri IV hunted. The adjacent path can be followed on foot, cycle or horseback for miles, through the ancient oak forests and vineyards. The house has been restored with taste and style. 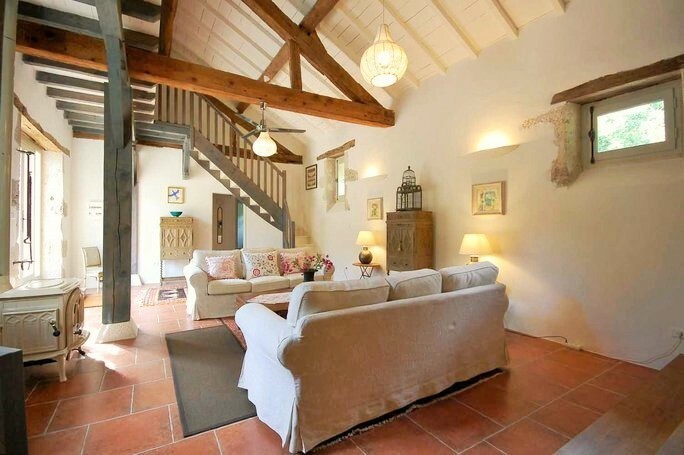 Sympathetically rustic yet modern. Upon entering the house there is a feeling of space. The ground floor is airy and open plan allowing those who love to cook every chance to do so whilst also keeping an eye on the little ones and being part of the party. The living area is cosy and bright with a high ceiling and a large woodburning stove. Leading from here, a small passageway gives way to an easy access double bedroom and large shower room. The kitchen and salon lead outside onto a large wrap around terrace facing south and east across the garden, through vines to a little orchard. There is a large 6m x 12m enclosed pool, surrounded by another large terrace, at the end of the garden. From here a little path snakes its way through flora and fauna to reveal a small natural lake. 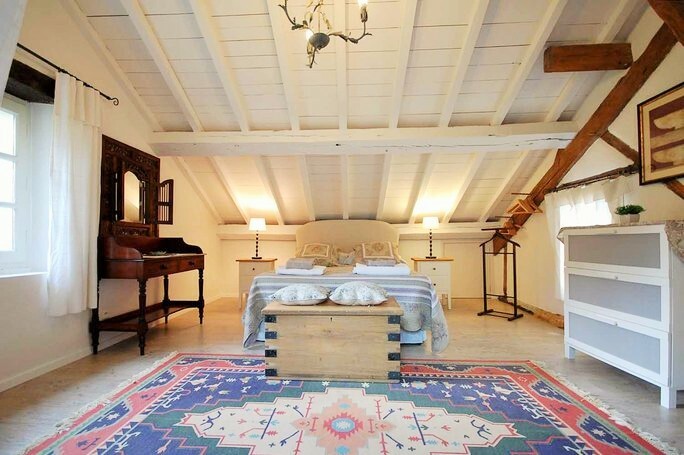 Upstairs takes us to the minstrels gallery where we’ll find two pretty double bedrooms with en suite bathrooms. Once again, light bright and stylish. The first bedroom faces south with steps leading down to a cozy bathroom. 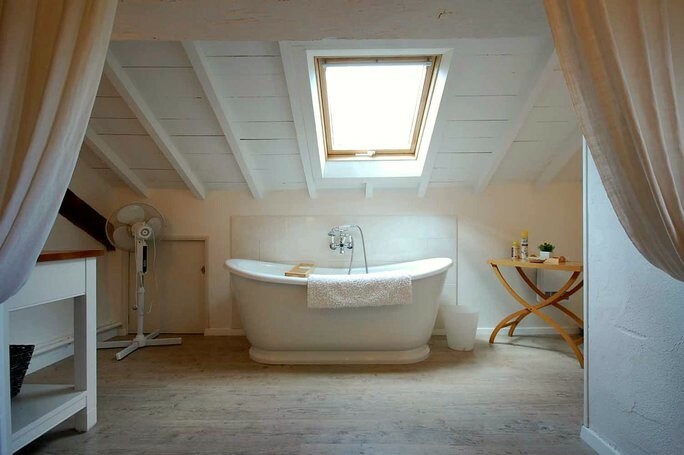 The romantic master bedroom has views across the garden to the east and is complemented by an island bath facing the stars through the window above. 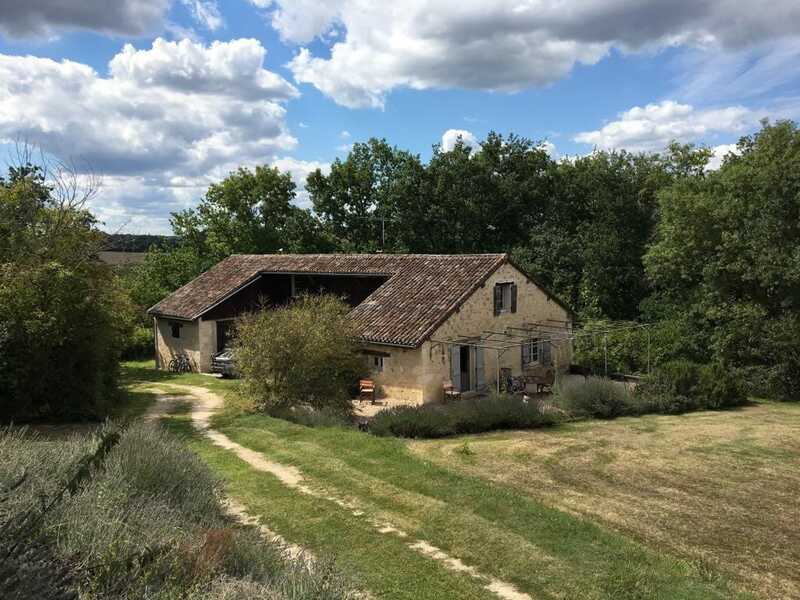 Attached to the house is a high-ceilinged outbuilding which has the potential to offer additional living space with views across the valley towards the setting sun. With the necessary permissions of course. 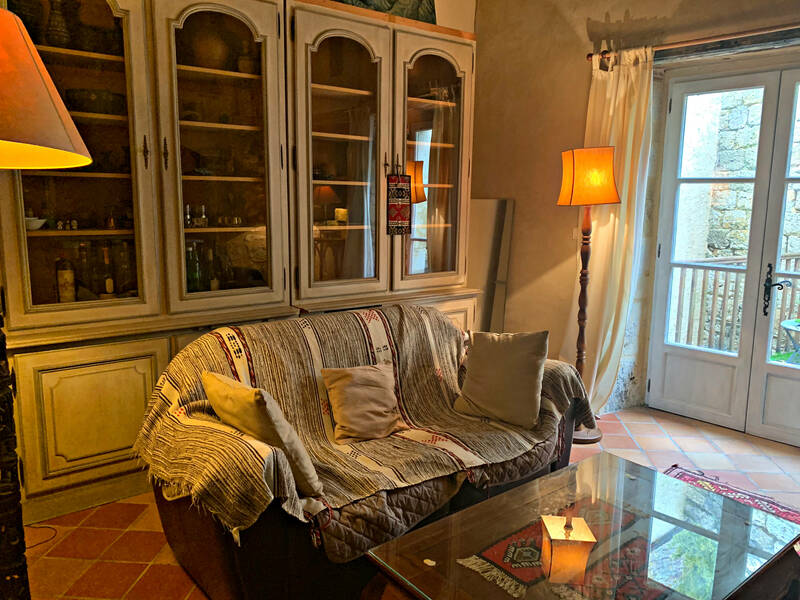 To conclude, a beautifully restored stone barn, family home or holiday home, secluded yet in easy reach of all amenities in the neighbouring riverside market towns. A little gascon gem. the salon area with the huge glass doors and windows shedding light across the room and the pretty mistrals gallery separating the two upstairs bedrooms ensuring a good night’s sleep for all.